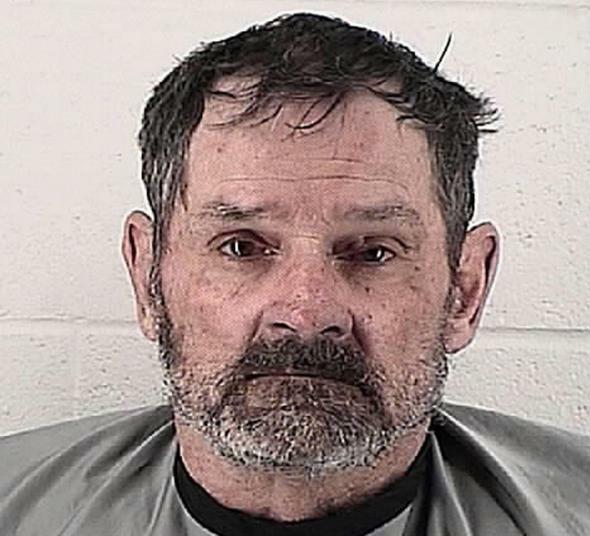 The man who admitted killing three people at two suburban Kansas City Jewish sites told jurors he hoped to “die a martyr” for the shootings. It took the jury little over two hours to find Frazier Glenn Miller Jr., 74, guilty of capital murder, three counts of attempted murder and assault and weapons charges. None of his victims were Jewish. Their names are William Corporon, 69, a physician; his 14-year-old grandson, Reat Underwood; and Terri LaManno, 53. A fact Miller did not learn until six days after the shootings. Frazier Glenn Miller, also known as Frazier Glenn Cross, wrote on a courtroom poster board “Diversity is a code word for white genocide”. Miller’s virulent antisemitism and white supremacist ideology has never been in doubt. His website, with its rudimentary design, mixes the iconographies of the Ku Klux Klan and the Confederate flag. He recommends visitors check out ex-KKK grand wizard David Duke and get ‘jew-wise’. Miller published his own book, titled ‘A White Man Speaks Out,’ written between 1987-1990 (when in prison), and completed in 1999. He joined the U.S. Army in 1959. Miller’s website claims he served two tours of Vietnam and was a Green Beret for over a decade. But within this rambling antisemitic text, he reveals how he discovered his ‘true calling’. In 1978, his father gave him a copy of the racist, antisemitic newspaper, The Thunderbolt. According to Miller, within ‘two minutes’ he was ‘ecstatic’ to find his place within the ‘American White Movement’. In short, the newspaper articulated his political and racial views. He confessed that before reading, he considered himself an antisemite and racist. Miller blamed Jewish communities for defeat in the Vietnam war; for black emancipation. A problem he attributed to ‘heavy Jewish influence’ in the media. An ardent Holocaust denier, he also read Hitler’s Mein Kampf and William Pierce’s white nationalist text “National Vanguard”. In 1979, he joined the neo-Nazi National Socialist Party of America, after quitting the National States’ Rights Party. Members of the National Socialist Party of America had murdered Communist Workers Party members at a rally. It contributed to his decision to move to Chicago. 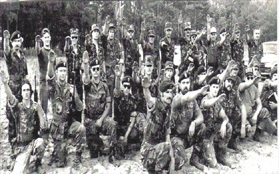 Miller’s white supremacist activities signalled retirement from army life. During the 1980s, he created the Carolina Knights of the Ku Klux Klan. He sought to emulate Hitler, in his autobiography he wrote “My racist and anti-Semitic thoughts consumed me every day of my life. And, I was therefore, compelled to do everything possible to awaken White people, to organize them, and to try to save the White Race and Western civilization from those whom I believed were working to destroy both”. The Southern Poverty Law Center (SPLC) noted how Miller’s Carolina Knights marked a departure from KKK norms: gone were the clan robes, replaced with army-inspired fatigues and military training. Inspired again by Hitler, the organisation held rallies and marches on a near-weekly basis. 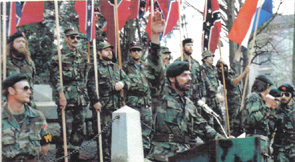 In 1985, he founded another white supremacist group, The White Patriots Party. SPLC also linked Miller to a white supremacist terrorist group named The Order. A still from a speech Miller delivered in the WPP. An example of the racist WPP propaganda Miller put online. They used the legal system to break up Miller’s racist paramilitary. In spite of his conviction (pending appeal) for criminal contempt, he later became subject to a nationwide manhunt after declaring ‘war’ on Blacks and Jews. Miller appealed to his thousands of followers to overthrow the government in a ‘race war’. “Let the blood of our enemies flood the streets, rivers and fields of the nation,” Miller wrote: “Rise up and throw off the chains which bind us to the satanic, Jewish controlled and ruled federal government. Let the battle axes swing smoothly and the bullets wiss [sic] true”. By 1987, more than a dozen federal agents and state law enforcement agents captured Miller at a mobile home in Missouri. Once the tear gas cleared, officers found a hull of weapons: hand grenades, automatic rifles, pistols, about twenty pipe bombs, and flack jackets. Miller had also posted thousands of copies of his “Declaration of War” to fellow white supremacists and media outlets. To reduce his impending and lengthy prison sentence, Miller struck a plea bargain: he faced five years in prison in exchange for his cooperation and testimony against his former compatriots. He went on to claim in his autobiography that “I got myself out of prison without putting anyone else in”. In the end, Miller served less than three years of that sentence. Upon release in 1990, the federal government issued Miller a new social security number under the name Frazier Glenn Cross. In Iowa, he pursued a new career in truck driving. There is scant record of Miller’s formative years in Iowa and Nebraska; but he never recanted his beliefs. The internet provided Miller a wider outlet and white nationalist network. Outside his own website, Miller contributed over 12,000 posts to the Vanguard News Network (under the username “Rounder“). Miller asked Alex Linder, the Vanguard News Network’s admin, to post his online confession on 23 October 2014. He contributed and published Linder’s propaganda newspaper ‘The Ayran Alternative‘. Miller confessed that his “conscious compelled me to kill Jews. That’s why I feel perfectly justified. My biggest fear was that I’d die without killing any Jews”. A paranoid Miller convinced himself that police monitored his online activities and offline movements. To ‘throw them off,’ he Googled Islamic community centers, Hispanic community centers, Baptist community centers. He admitted making various trips to Jewish Community Center in the week leading up to the shootings. On the day of the murders, Miller visited the center three times. His target number was “maybe six or eight”victims. By 1pm, he returned to the Jewish Community Center. He claimed that he had a pistol in the front seat and two shotguns and a .30-caliber carbine in the trunk. His documented health problems, chronic emphysema, meant that Miller sought a quick trial. Yet, he treated it as a spectacle: he fired his attorney and used the public platform to justify his race hate. He argued that: “According to the Declaration of Independence, it says that when a government conspires to destroy a people, it is not only the duty of the people, it is their right to rebel and replace that government”. Jurors found him guilty of aggravated assault for pointing a shotgun at a woman and asking if she was Jewish. When she replied ‘No,’ he put his gun away and allowed her to live. On Christianity, Miller wrote “Christianity is the second biggest trick the Jews ever played on us. The biggest was legalized abortion!” But it still represented the best hope for ‘white survival’. He preached a return to Odinism. Miller also had a history of failed political campaigns: his most recent, in 2010, earned him a platform with Howard Stern; but he only managed seven votes. A life of hate may soon end via a death sentence; if his chronic health problems do not catch up with him first. If Miller’s goal sought to divide Jewish communities, it failed, and for the victims, a measure of justice. Sentencing takes place in late October.